Making roasted vegetables is as easy as putting them in the oven, but making the best, most delicious roasted vegetables—soft and tender, browned and caramelized, full of intensified flavor—involves a few tricks. Make perfectly roasted vegetables every time by following the insanely easy tips here. You may also want to see recipes for specific roasted vegetables, but these steps really do apply to any vegetable: from asparagus to zucchini, delicate ripe tomatoes to hearty root vegetables. The only thing that will change is how long things need to be roasted. Arrange a rack in the top third of an oven and preheat the oven. The exact temperature doesn't matter too much. Setting the oven to 375F is great, but anything in the 350F to 425F range will work. While the oven heats, make the same vegetables the same size. Smaller vegetables can be roasted whole... as long as they are of even sizes. You want even pieces so the vegetables cook at an even rate. In general, vegetables need to be trimmed and cut—larger pieces will make a more dramatic presentation whereas smaller, bite-size pieces are easier to eat. While you can roast vegetables just as they are, they will be much more delicious if you take the time to oil and salt them. Either in the roasting pan or a large bowl, toss vegetables with a tablespoon or two of olive oil or the oil of your choice. Oil helps the vegetables brown, so don't skip this step. Drizzle the vegetables with the oil, then toss to coat them as evenly as possible. The reason roasted vegetables at restaurants always taste so great? They are seasoned in layers and given a bit of space. A bit of salt at the beginning and another small dose of salt when they're done. Give the vegetables a sprinkle of salt before you pop them in the oven. You can give a final, finishing sprinkle of salt at the end, so just add a little bit here. This is another opportunity to toss on additional seasonings such as herbs you want to roast with the veggies, aromatics such as onions or garlic, or a dusting of spices that will benefit from the heat of the oven. 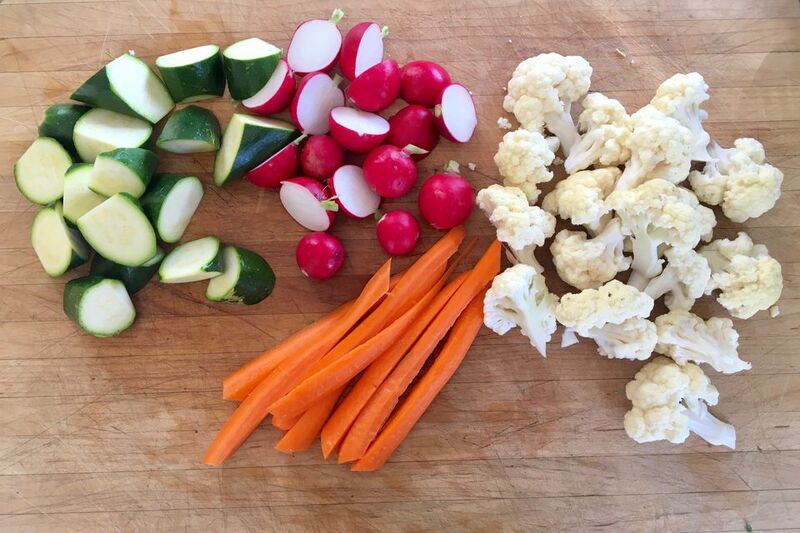 The final element of preparing the vegetables for roasting is to arrange them in a roasting pan or on a baking sheet. You want plenty of hot air to be around the vegetables, all around. The less the vegetables touch each other, the more area on them will brown. Use a pan big enough to hold the vegetables in a single layer. For easy clean-up, consider lining the pan with parchment paper. You may also want to know that the more cut sides are facing down, the more browned area you'll get. When they're ready to put in the oven, make sure there's a rack in the top third of the oven and roast the vegetables there: it will help the vegetables brown the best. The vegetables will start to brown on the bottom first (the side in contact with a hot surface will brown faster than the sides in touch with hot air), so for even browning you'll need to turn them. When the vegetables start to brown, give the pan a good shake or use tongs or a spatula to turn the vegetables to move them around a bit to brown evenly. You want roasted vegetables to be two things: brown and tender. Keep the vegetables in a hot oven until they are both. If they start to get too dark, cover them with foil until tender, then cook for a final 5 minutes or so with the foil off. If they aren't browning, raise the heat in the oven and move the pan to the top of the oven. Roasted vegetables are great while still warm, obviously, but many—including peppers, asparagus, eggplant, and tomatoes—can also be served at room temperature to great effect. 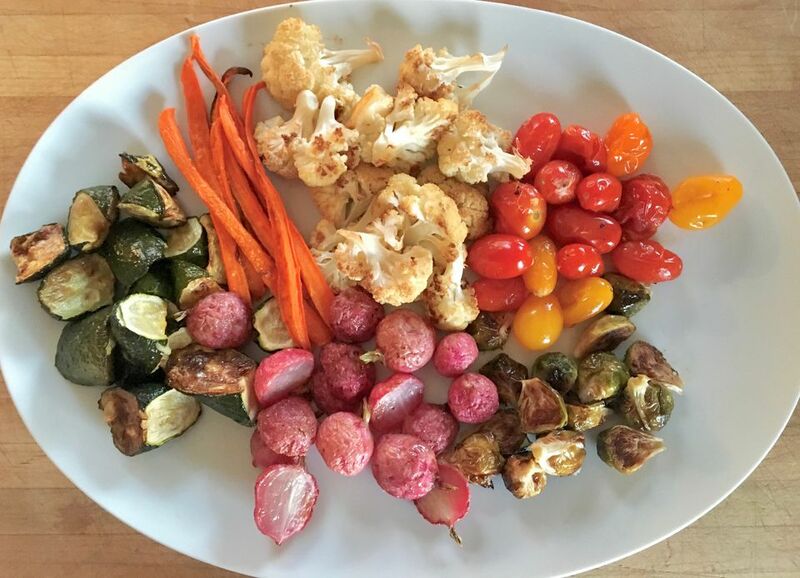 If you want to serve room temperature roasted vegetables, however, be sure to let them cool in a single layer, uncovered or very loosely covered, so the vegetables don't start to steam each other and get soggy or sad.